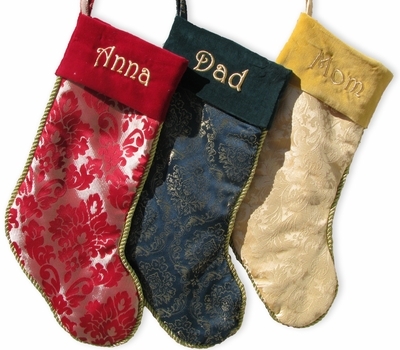 Superb Quality Damask Christmas Stockings! 19" Damask Christmas Stockings. Each stocking body had nice damask design and the stocking is trimmed in a fancy gold twisted rope........cuff is then elegant sueded velvet. The listing is for ONE stocking, we have pictured all three colors together so you can see what they look like together if you decide to make a set. And yes, personalization or monogram is free! Choice of 3 designs - just use the pull down menu right under the add to cart button to make the choice of either silver or gold. Embroidery personalizing **FREE OF CHARGE**. Materials: Damask and polyester Christmas stocking. Fully lined inside with soft polyester fabric insert. Measurements: This Christmas stocking measures 19" long along the diagonal from the top of the cuff to the toe; and the width across the cuff is 6 and 1/2". Personalized: Names can be personalized on the cuff of these gorgeous Christmas stocking. Personalized in metallic embroidery thread - see additional images for personalizing choices: Embroidery thread color and Embroidery font. This stocking looks great embroidered in gold or or other metallic threads!